I had a whole empty day last Sunday, so I got my sewing machine out. I recently had an idea about what to do for my first quilt, but made myself promise that I would finish my teacosy first. 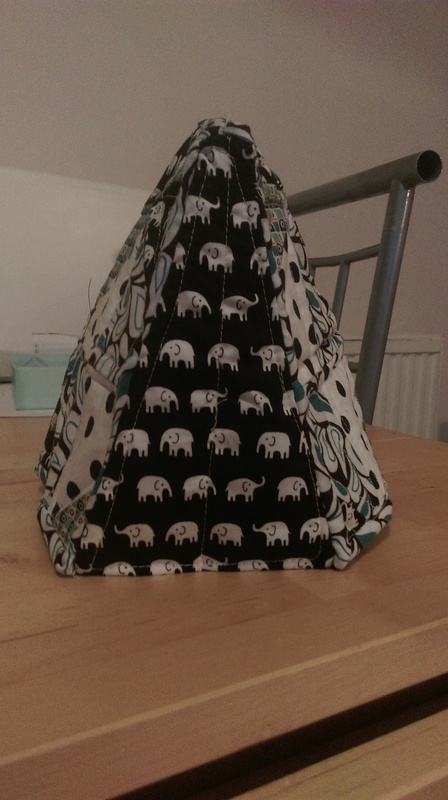 I started making a teacosy about three months ago. I wanted to make a quilted object that I would use and that I could just have a go at all the different techniques on, so I bought some insulated batting to play with. I was using the tutorial from quiltingjetgirl as a starting point. Her tutorial is for a reversible teacosy and I decided that for the moment that’s probably not necessary. So I mostly used it as a size guide. I used the sizing for the larger teacosy. In my first session of sewing I pieced together two panels. I cut some right angled triangles – I think half square triangles in quilting lingo – and then pieced them together as pinwheels. I did this in strips, so each panel was three strips of triangles. 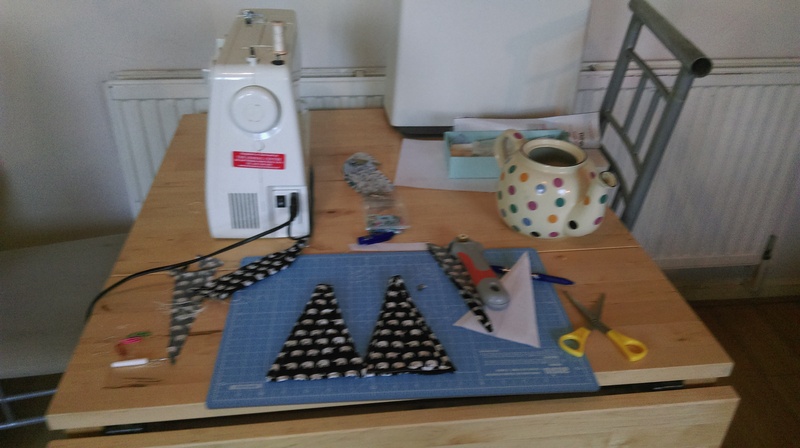 I really enjoy the process of patchwork, of the cutting shapes, and choosing colour combinations and then seeing the patterns evolve as you sew them together again. The pinwheels were quite tricky to match together. If anything I got worse as I went a long. I definitely need to rethink how I cut the fabric. I don’t have a lot of space so when cutting from large sheets of fabric, some of it hangs off the table. This can then move and distort when I’m cutting it. Today I tried cutting on the floor – this was also pretty tricky. I couldn’t quite get the right angle. This is my sewing space. It gets a little crowded. So once I’d got them pieced, it was time to quilt them together. It took me so long to figure out how to put a walking foot on my machine. I managed to dislodge the automatic needle threader (and no I still don’t know how it works). Eventually I got it going again and began quilting the first panel. And I hated it. The tension was wrong and the thing warped quite a bit and it was generally all a bit frustrating. With hindsight at least some of these problems would be solved if I a) bought some of the spray glue to baste it together properly and b) maybe practiced beforehand. But I’m impatient and cheap (the spray glue is expensive). And at this point I just put it away to deal with another day. So when I got my machine set up this time, I just blitzed the quilting. Somewhere along my reading travels I read that if you quilt the lines in opposite directions it helps with the warping. And it definitely helped but this half was even less well basted so it still didn’t go that well. 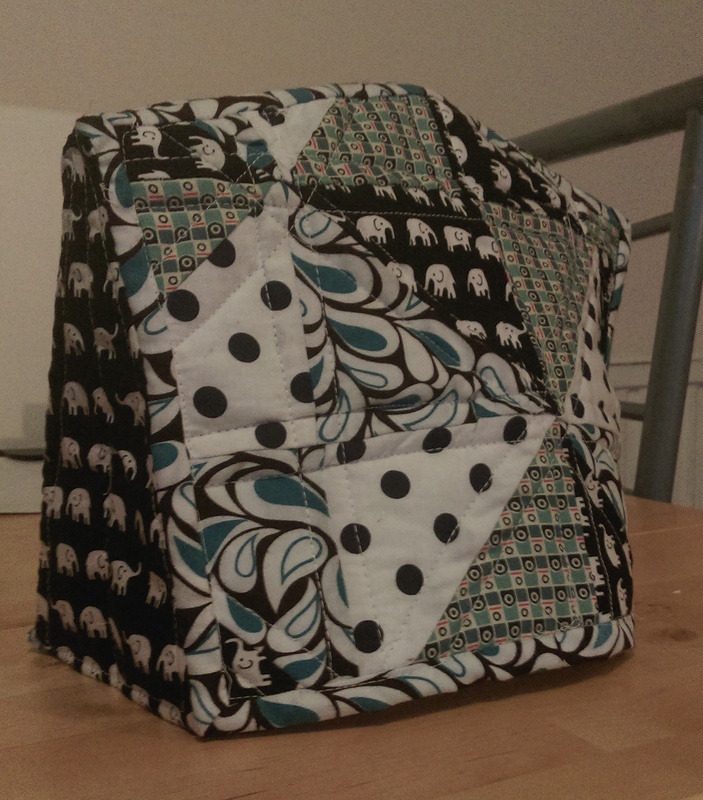 And then I had to learn how to bind the quilted halves. A quick google threw up this tutorial from cluckclucksew. I chose this one because it looked simple and didn’t include any hand sewing. The instructions were really easy to follow and it was a great way to get very neat corners. My biggest problem was I didn’t take enough care with the seam allowance when I sewed the binding to the front of the quilt. This meant when I was sewing it to the back it was really hard to get it to line up with the edge of the binding on the front of the quilt. My teapot must be incredibly fat, because despite having used the larger sizing, there was no way it would have fitted if I’d sewn the pieces straight together. So I added side panels. I cut two equilatrial triangles, where the edges are the same length as the height as the panels. 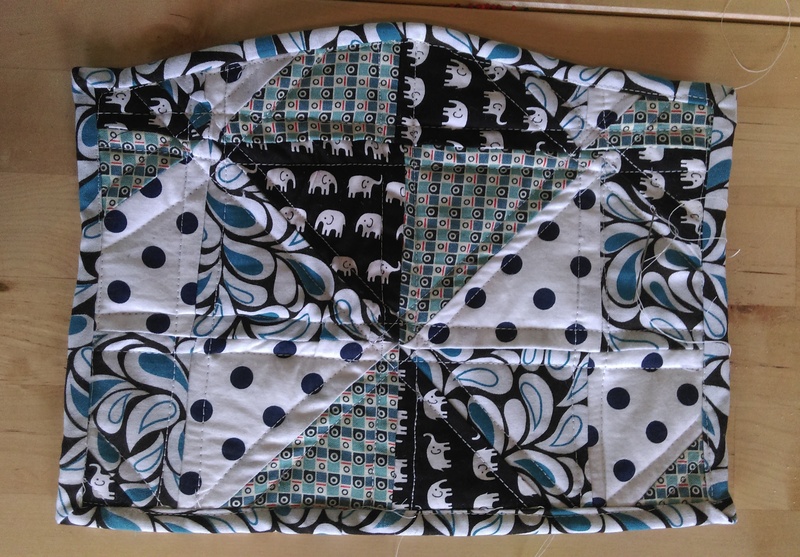 I quickly quilted with a single line, then used the back fabric as the binding. This is definitely a quicker method but doesn’t look as good. All that was left to do then was handstitch the panels together and I had a finished teacosy. No it’s not perfect, and it’s a funny shape (the side panels could have been smaller) but it keeps tea warm. And really that’s all a teacosy needs to do.